A parking garage can be cool? Photo tour of DFW’s new high tech Terminal A parking! I once missed a flight to LAX because I couldn’t find a parking space at DFW’s Terminal C (this was before valet parking was available). Perhaps because of that, parking is usually the only part of the travel experience that causes me to stress. I’m cool with the traffic delays and the endless road construction projects that are part of life in Dallas. And with Priority Access and Pre Check, security lines are never an issue. Bad weather and flight delays? No big deal. But parking? Now that can stress me out! 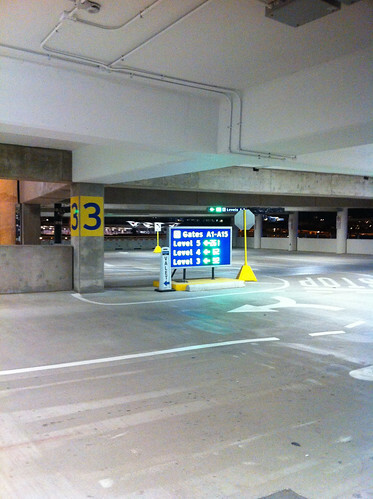 Terminal D parking is convenient and modern, and finding a parking spot is never a problem. For a late morning or afternoon flight, I’ll sometimes park at D even if I’m leaving out of a different terminal. The SkyLink train is quick and it doesn’t take long to travel from D to another terminal. I’ve also become a fan of off-airport parking (especially with those 15% off coupons in the back of the American Way magazine). I can reserve a spot in advance, and with multiple terminals, when I get back into town it often takes less time to get from the gate to to the car. Anyway, I could go on and on….let’s just say that I obsess over parking like others do the upgrade. Maybe that’s why I geeked out a couple of weeks ago, when I finally had a flight leave out from one of American’s newly renovated gates at Terminal A. After many months of construction, DFW Airport and American Airlines recently opened a newly renovated section of Terminal A when they completed Phase One of their Terminal Renewal Improvement Programn (TRIP), and Phase One included a brand new, high tech parking garage. The old garage was designed in the late Sixties or early Seventies. And I’m not sure if it was because cars were so large back then, or because the garage was designed by the same people that created Harvest Gold, Avocado Green, or the AMC Gremlin, but it was poorly designed and had all these disorienting half-levels. Even worse, there were no elevators or escalators in the parking garage – you had to drag your suitcase up and down stairs. How did that ever seem like a good idea? This is Dallas. We drive everywhere and NEVER take the stairs! After I got my chance to try out the new garage, I had the opportunity to talk with DFW Airport staff Julie Ludeman and Lesley Merritt regarding the Terminal Renewal Improvement Program when the @AmericanAir team invited me to tag along during the #AADFW Field Trip they hosted for some of their most active Facebook fans. I learned that two priorities when they designed to the new garage were to address complaints about the lack of elevators, and fix the strange half-levels. Another goal for the new garage was to make it even better than the (already advanced) Terminal D garage, which already does a great job of using technology to make parking easier. 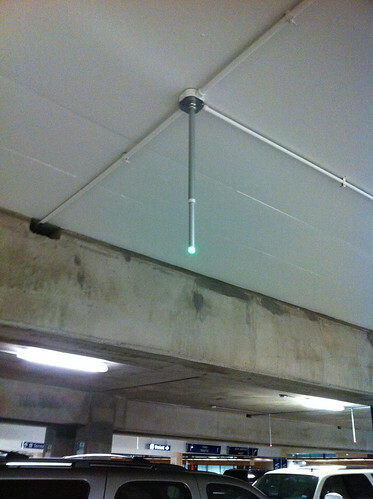 The managed to do that by installing a Parking Space Counting System that tracks the number of spaces available in the garage. And while the new parking garage might not be quite as advanced as the one at George Jetson’s apartment complex, it’s almost as convenient! 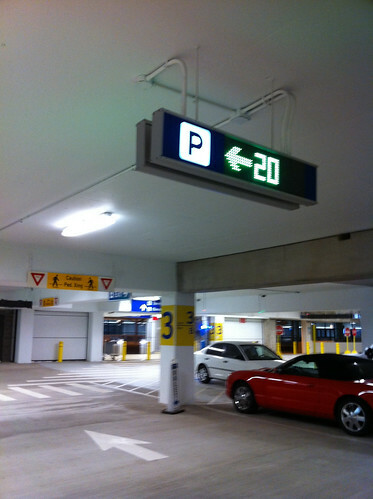 When you pull into the garage you’ll see signs indicating the number of parking spaces on each level. 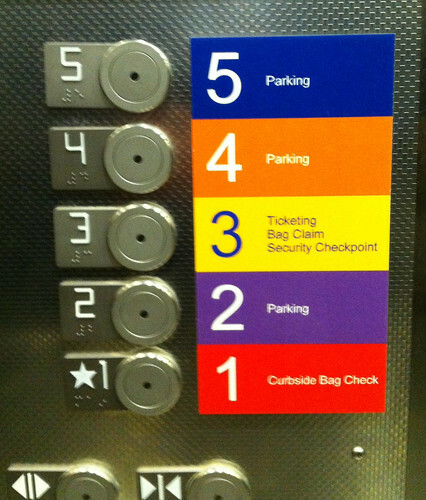 When you get to a level, you’ll see displays indicating the number of parking spaces on each row. 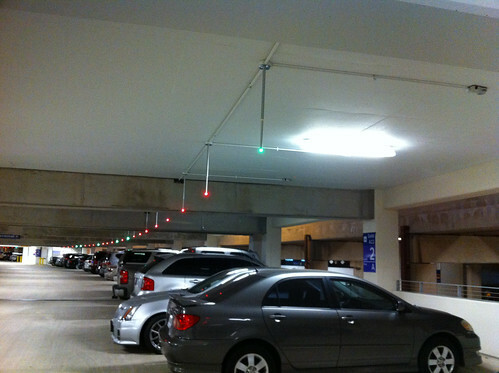 Red and Green Lights indicate which parking spaces are available. A Green Light leads you to an open space. And another great improvement – elevators! Something else I learned during the #AADFW Field Trip: the parking garage was an afterthought. The original Terminal Renewal project plan didn’t include a new parking structure, and the decision to add it was made after construction on the terminal began. The really shocking part is that the parking lot took less than 18 months to fund, design, engineer, and construct – almost nothing happens that quickly in Dallas. I wish the same people who built the garage were in charge of Dallas freeways! I was glad to see these when I was heading home recently too. Those red/green lights really stand out from inside the garages at night! I work for the main BARC Joint Venture partner that constructed this parking lot and remodeled the first few gates of Terminal A. I am proud of that parking lot (though I haven’t had to us it). Your pictures do show an outstanding system. Can’t wait for the rest of the work to be completed. We are also now involved with the new construction on Dallas Freeways in downtown Dallas (Horseshoe Project). Hopefully we’ll do well there too and fast. Finally…they’ve had these in Singapore for as long as I have visited over 10 years ago. My wife constantly complains about the lack of technology in the US when it comes to everyday stuff. I’ve flown out of BWI airport and the parking garage over there are the similar to what you described. I def do find them convenient!! For the 1 out of 12 males who are red/green colorblind, those lights aren’t going to be too informative. Looks like the system needed some tuning because your 3rd picture shows a green light in the first spot but it’s occupied.